Grant funding awarded to the Humane Society of Summit County from the Petfinder Foundation supported a Dogs Playing for Life mentorship session for a member of our staff. Grant support was instrumental in helping HSSC rejuvenate and further develop its canine playgroup program. Since completing the mentorship program, our participating staff member has relayed her new knowledge gained from the session to other Animal Care Associates, helping them to feel more confident and comfortable during playgroups. Since the beginning of February, playgroups at HSSC are now held every day, weather permitting, allowing many more of our rescued dogs to experience this highly effective enrichment and peer-to-peer socialization. 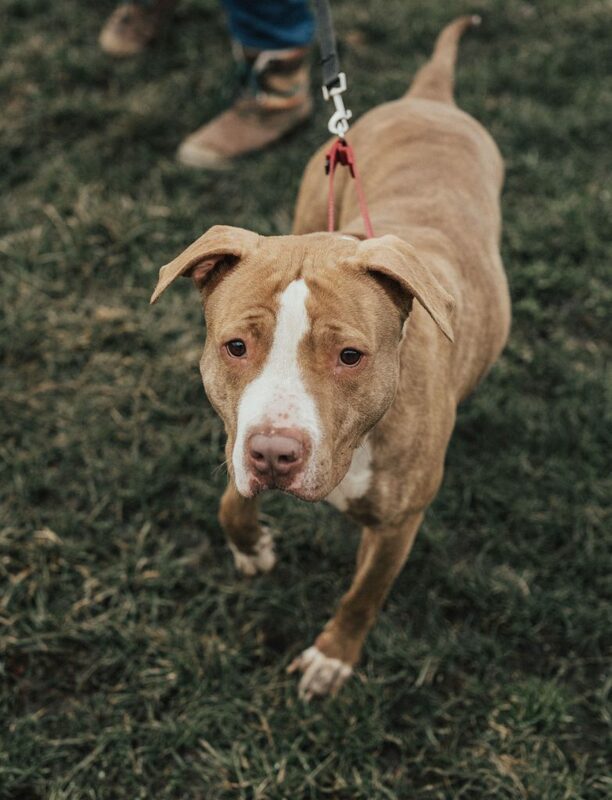 Ceres, a pit bull terrier mix, was rescued as a victim of animal cruelty by HSSC Humane Officers at the end of 2018. Although she recovered from her ordeal rather quickly, Ceres struggled with the common stressors within our shelter environment. New dogs, constant visitors, and a variety of unfamiliar smells and noises can be overwhelming and stressful for some rescued dogs. Ceres’s behavior reflected her stress and anxiety. During her first few weeks in our care, she would shred, chew, and tear any blankets, beds, or toys given to her in her kennel, and, on a few occasions, she swallowed the pieces. Fortunately, she experienced no serious health complications, but all of these items were then prohibited from her enclosure for her safety. In order to alleviate her stress, HSSC’s behavioral team began to include her in playgroup sessions. Each day, Ceres enjoys an intense play session with a few of HSSC’s other rescued dogs with compatible play style. Playgroup participation had a wonderful effect on Ceres. She is calmer in her kennel, and with a bit of time, blankets, beds, and toys have been reintroduced to her kennel. Luckily, Ceres no longer destroys them! Her stress-induced behaviors have been eliminated by her playgroup participation. Today, Ceres is a star in playgroup! She plays well with most of the other dogs, and it’s wonderful to witness how the program has benefited her overall well-being. Ceres is currently available for adoption at HSSC. Learn more about her on Petfinder here.